Here's the list in text form for people who prefer to see them that way. Guest Author at I Read Encyclopedias for Fun! Which mistake or bad habit in writing is the most difficult for you to stop doing? Christmas is coming! In your opinion, what would be the perfect gift for a writer? The New Year is coming soon. What are your plans for 2015 in terms of writing? In addition to myself a number of other authors weighed in. There were some interesting answers...most notably what most of the authors wanted was "more time." Of course, writing full-time is the best way to get such a thing. I really feel for those authors (the vast majority) who have to balance a "day job" and work. I'm eternally grateful for all my readers who have given me this gift. I couldn't ask for anything better. (generally a savings of 70%!) 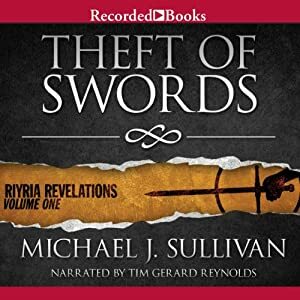 I'm so pleased that Orbit included the first book in my Riyria Revelations series, Theft of Swords in today's daily deal. Here are all the titles on sale. So if Santa brought you a kindle, or you have one and want to get some great titles, inexpensively. Check it out...but hurry - the sale ends in about 14 hours. Considering how few spots there are in the various "best of" lists, I'm always amazed and honored to find my books on them. 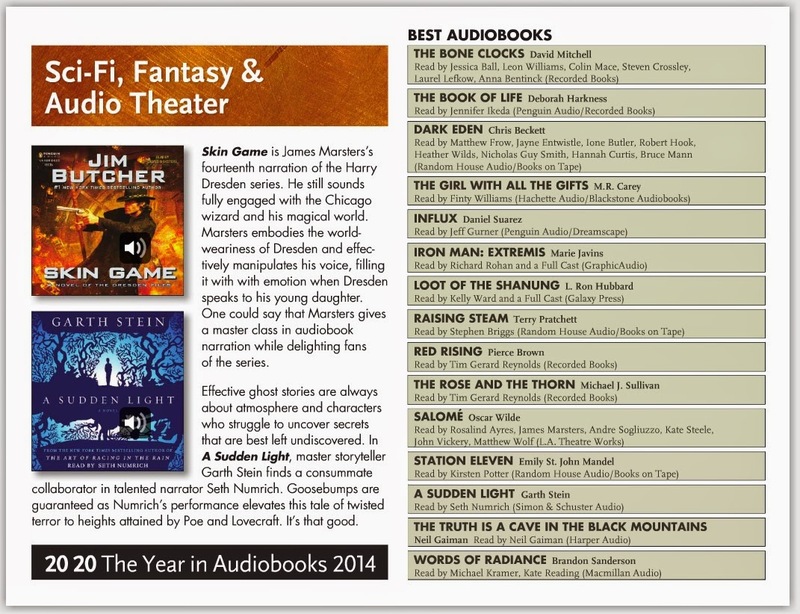 Audiofile Magazine is "the source" for keeping up on books in audio and I'm thrilled that The Rose and the Thorn made their best of 2014 list. I'm thrilled that the narrator for Riyria, Tim Gerard Reynolds got not one but two nods on this list. The only narrator to do so. I'm also pleased to announce that Tim Gerard Reynolds will be on board for two new projects of mine coming up soon. The first is The multiple book series The First Empire, and the other is Riyria Chronicles #3. No release dates on these works yet, but I'll be sure to let people know. 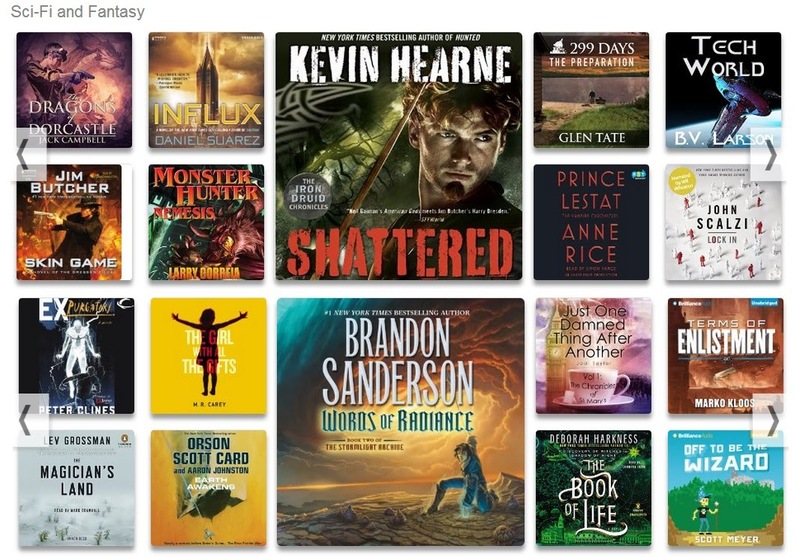 One of the cool things audible does each year, is provide a list of the books that received the most 5-star reviews broken down by a number of categories. 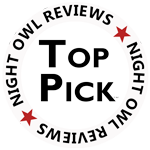 In addition they provide their "Best of Everything" indicating the books with the highest 5-star ratings regardless of category. I'm pleased to say I've made the "Best of Everything" twice. 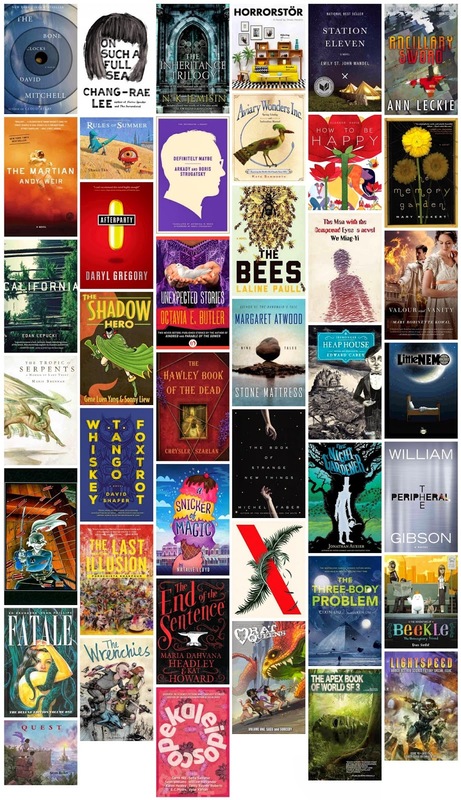 While I didn't have any books hit this year, there are a lot of great ones that did, and I wanted to share them in the hopes of you finding a great new book to try. Here's the selections for "The Best of Everything"
Happy Holidays and I hope you find something great to listen to! Here is a link to the full list. For those that are lazy, but still curious, here is what each person picked. What's your favorite listen of the year? Yep it's time for yet another "best of" list. 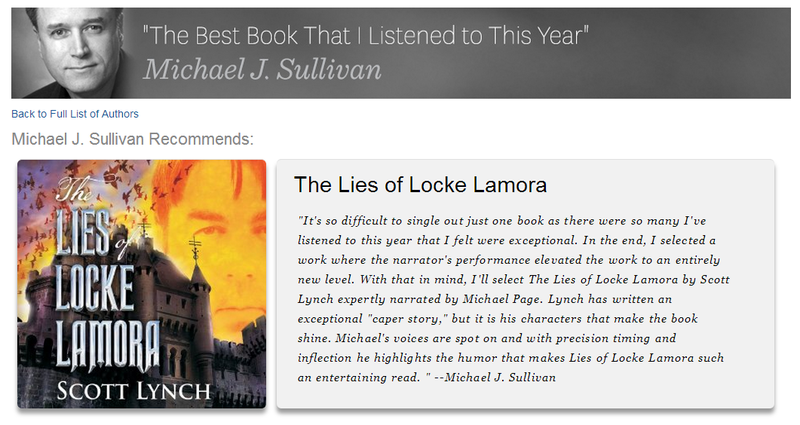 This one brought to us by the amazing people at Audible.com. 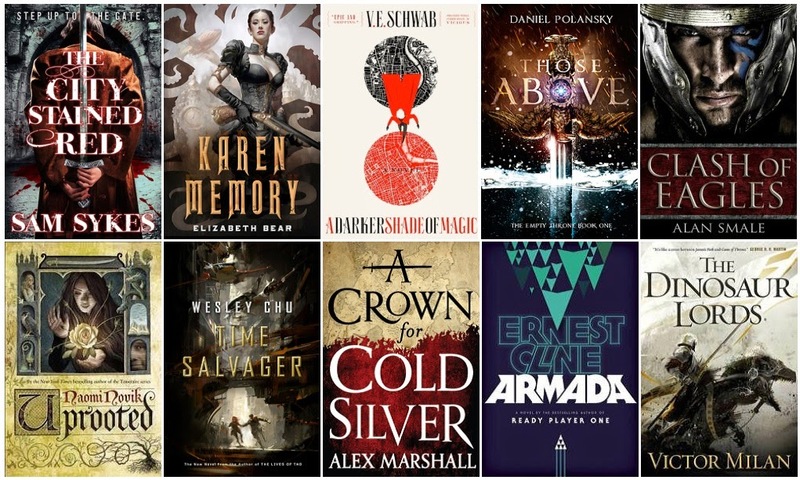 So here are their picks for the Best Fantasy of 2014. So go grab some earbuds and give a listen, there's these and plenty more good listens over at audible.com. The format of the images makes it a bit hard to see exactly what was picked, so here is the full list for your reading pleasure. I must say that I get a bit tired of hearing how self-published books scam readers with fake reviews and artificial rankings. I've been in (and watched) the self-publishing world for a long time now, and I can tell you the professional self-published get their sales and rankings based on what they should be...readers who love books and say so. Yes, there are a few bad eggs who operate in disreputable ways, and this undermines an industry that deserves better. Given how self-publishing has benefited both writers (making full-time income), and readers (inexpensive books they love), it's sad to see these things happens. Which brings me to All About A's. 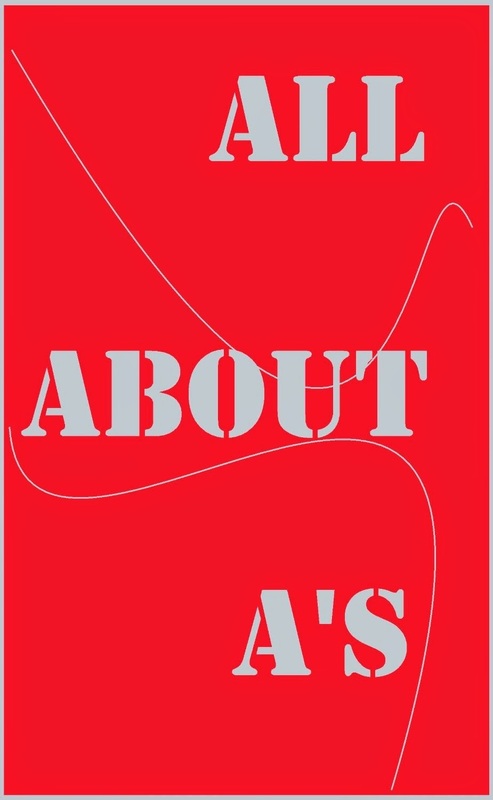 A book whose description says, "Have you ever wondered about the letter A? It's the first letter of the alphabet, but why? Who created it? This books purpose is to answer these questions, maybe. So sit back, buckle up, and enjoy the ride." Well, it's free so maybe some people downloaded it just as a joke or to show others. But this book is also in the Kindle Unlimited Library, and if a big part of that 222 ranking is through "borrows" it's going to hurt the legitimate authors in the program. This is because regardless of price, everyone in Kindle Unlimited gets an equal cut of a pool divided by a number of borrows. So, I do feel bad for the authors whose paychecks will be a little smaller until this book is removed (hopefully Amazon won't give this books author any cut and it will be a moot point). But, here's the part that really gets me...the reviews. A 4.6 rating and 119 of them. Are they paid reviews? Are they friends of the person who did this book? I've even seen comments on a writing forum who thinks it was done by one of the big publishers, no doubt to hold up as an example about the "quality" of self-publishing. So, I'm not sure if this is (a) a joke (b) someone trying to make a point (c) someone hoping for a viral 15 minutes of fame or (d) just someone trying to cash in with next to no effort. But no matter what the truth is, it's really not helping anyone, and I'm really sorry to see it released. 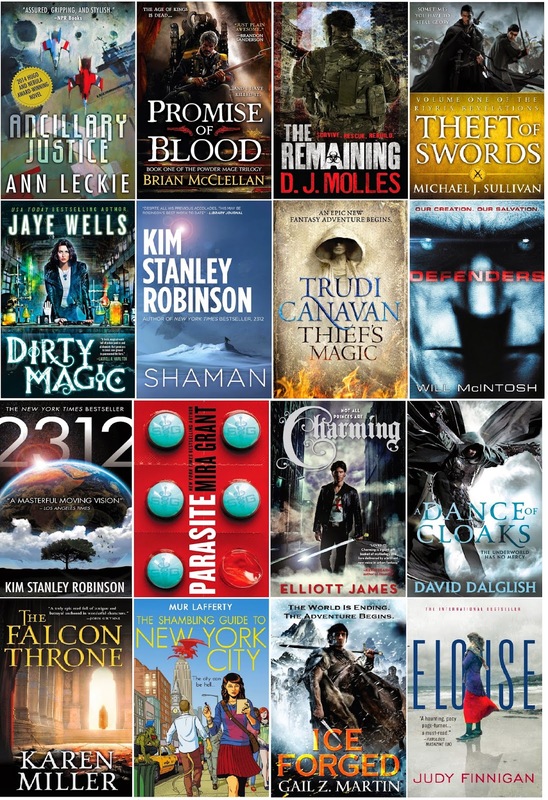 Tenacious Reader put together a really great list for books they are looking forward to in 2015. Here's a link. What's on it? Well, I'm glad you asked! 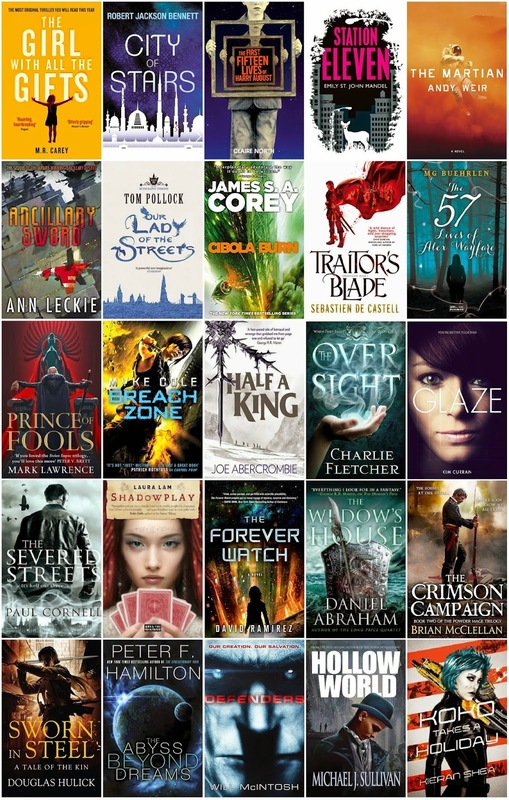 A lot of great books to look forward to! Add some to your "to be read" pile today! 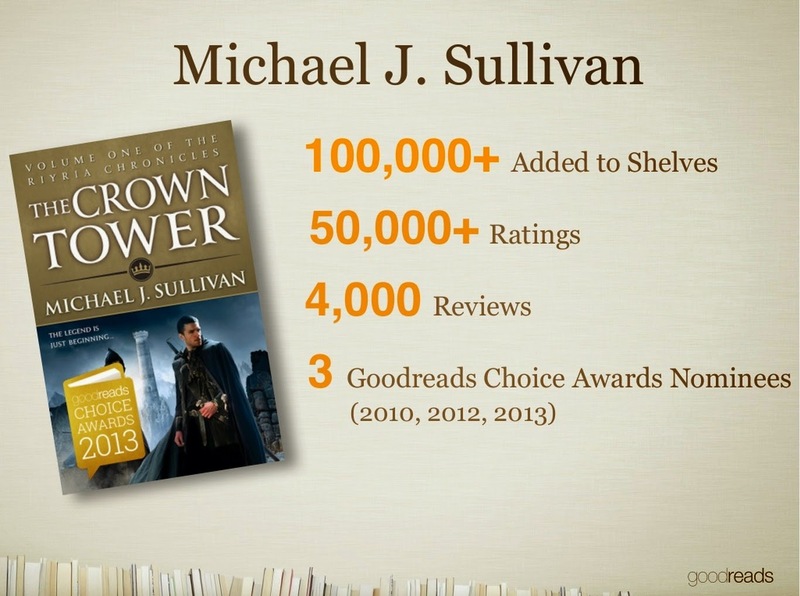 I've made no secret about my unabashed love for Goodreads as both an author and a reader. The only downside is the knowledge that I'll never make it through all the books that are constantly being added to my "to be read pile." But I love the community and their enthusiasm for the written word. 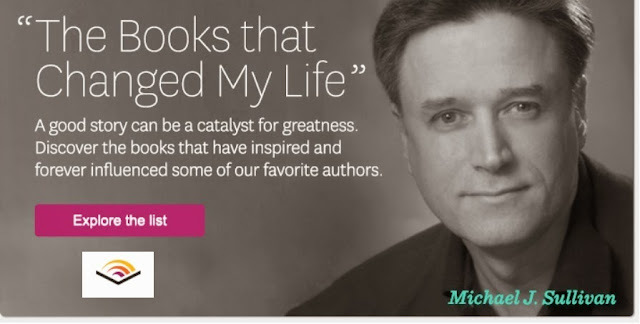 I think Goodreads is doing an excellent job fulfilling their mission "to Help Readers Find and Share Books They Love." At this years BEA (Book Expo America) Patrick Brown, Director of Author Marketing, did a great presentation on tips that authors can use to make their books more discoverable. Yes, I know that's not a word, but I'm exercising the authorial right to expand the English language through usage. I wasn't there, and I "sorta" knew it was occurring, because I started to see tweets about my name being mentioned. Yesterday, my wife ran across the online version of Patrick's slideshow. Be a reader first!! Participate in groups, review books. It's that time of year again, filled with "best of" and "most anticipated" lists. I'm honored to have The Riyria Revelations join a stellar line up over at Grimdark Reviews. According to my wife, who tracks this kind of things, that makes the 95th time on these types of year end books. Pretty amazing considering my own goal was to write book that I wanted to read. A number of lists have come out as well, including the final results of the Goodreads Choice Awards...no, Hollow World didn't win, but it really was an honor to be nominated. I'll try to do some posts on the other "best" of lists over the next few days. And I wanted to thank Grimdark for including my series in an amazing line-up! 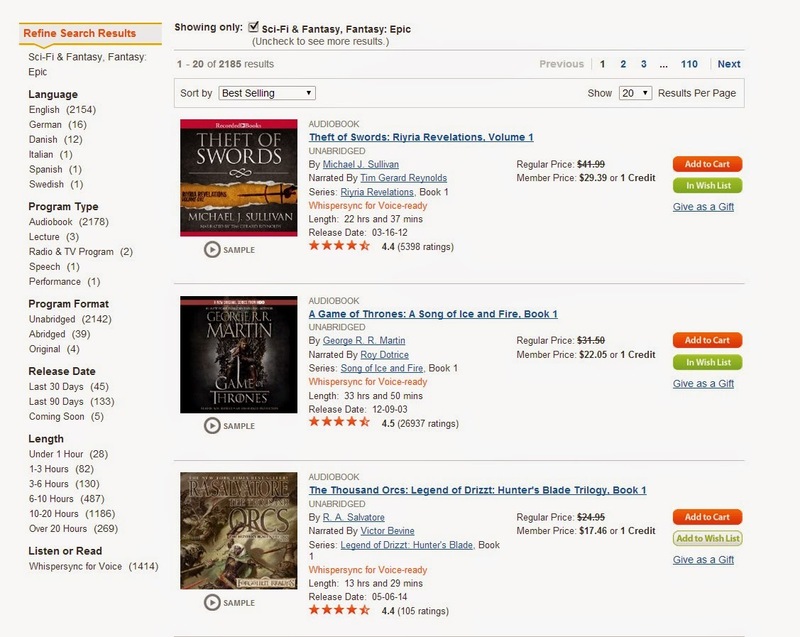 Last night I noticed Theft of Swords was the #1 best-selling epic fantasy book on Audible.com. It will probably be short lived, but it still is #1 this morning, so I have that going for me. I get a kick when my little books that were once self-published make any kind of splash, and I know a big part of the books popularity is the amazing Tim Gerard Reynolds (who narrators all the Riyria stories). Just click on one of the covers above to go to the free download page. I've already heard back from some of the winners, and the others have 1 week to respond before I pick someone else from the list. Congratulations to all the winners, and thanks to everyone else for entering / participating. If you would like to be eligible for future such giveaways, here are some links you can use to sign up. Request to join the Dark Room (a secret - private Goodreads group - just send me a message via email or from within Goodreads. 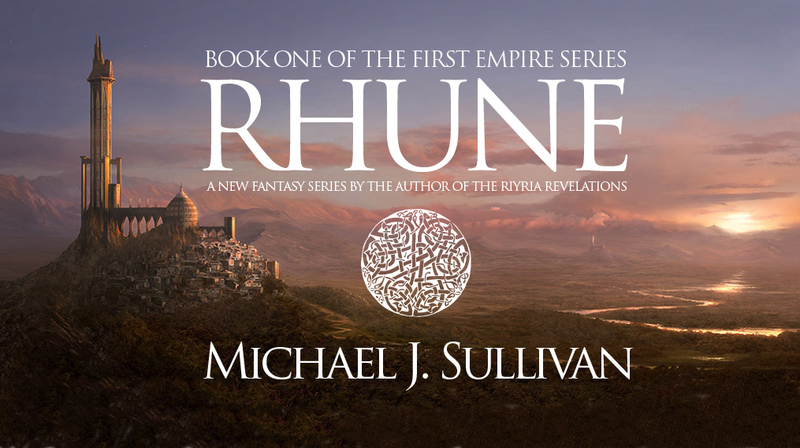 Sign up for release notification, pre-release specials, and giveaways for books in The First Empire, click here. NOTE: If you are already on the mailing list - you are automatically entered for future drawings. Originally I was going to print up the book in the same state as the first beta, but I now want to get the changes in and then print THAT version. I say this because it shouldn't take too long, and the people who won will get a much better book. If for some reason the edits drag on too long, then I'll revert to my initial plan. and Theft of Swords is one of them. 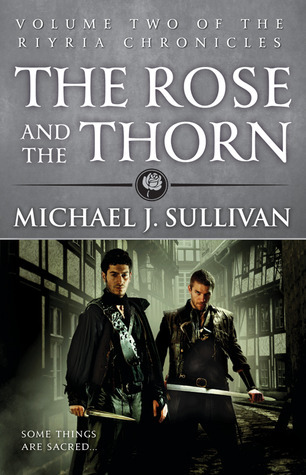 If you've thought about getting to know Royce and Hadrian now is the perfect time, but you have to hurry as the sale ends December 2nd, 2014. 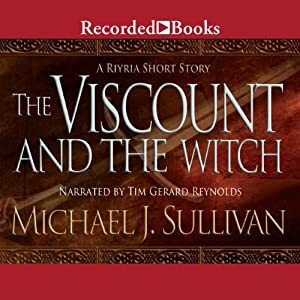 All the Riyria books are narrated by the amazing Tim Gerard Reynolds, and he is well worth a listen. 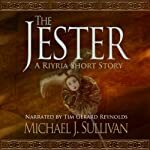 In fact, his recording of Theft of Swords received an Audie nomination when it was released. But don't take my word for it, 5,375 people have rated or reviewed the book they share my enthusiasm for Tim's remarkable narration. Imager's Intrigue: Book 3 of the Imager Portfolio by L.E. Modesitt Jr. I don't mind doing this...in fact, I enjoy helping fellow authors in any way I can, but it does take time. Time I sometimes have problems making room for. Over the summer, I was taking a bit of a break from writing. My concentration was on training for the Ride to Conquer Cancer and recharging my batteries after writing the first three books of the The First Empire Series. I also had some events that I was scheduled to speak at (such as the 2014 Writer's Digest Annual Conference). So I set my date to start writing book #4 after that and planned on doing so in a "heads down" mode where I cut back on just about everything else. Unbeknownst to me, my wife was in the process of setting up a podcast interview with RSP (Rocking Self-Publishing) to be squeezed in right before I started...then I moved up the date. Robin came to me with a fair amount of nervousness. She had a few problems. I was burned out on educational activities and wanted to pour myself into my creative stuff. The podcast host is "across the pond" so it would have to be in the AM - my writing time. She knew I wanted to focus on book #4 and even a brief podcast would be a disruption. Long story short, I didn't bite her head off and the interview went ahead. I must say, it was one of the best run interviews I've seen. The host was (a) knowledgeable (b) did his research (c) really knows the state of the industry. Since that interview, I've listened to a number of the other ones on his site and I'm continually impressed. Which brings us to today...or more accurately yesterday, as the interview went live. While cooking dinner my wife was listening to it and mentioned that, "You sound like you knew what you were doing." High praise from her...let me tell you. Hearing it, reminded me exactly what we had covered and I do think it turned out to be pretty informative. So I'm posting today to draw some people's attention to it and Simon. Listen to my interview here, and check out the back episodes as well. Lots of great information coming out of this podcast. Enjoy! Book #4 of The First Empire is done! 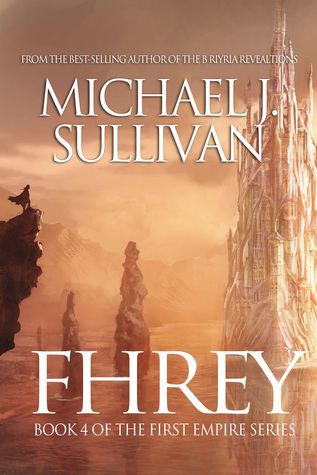 My goal was to finish Fhrey by November 15th, and I finished a few days early (November 11th). Please note, the cover to the left is a mock-up only and it will no doubt change. I learned a lot about this series writing the fourth book, and was faced with an important decision. Do I stick to my original concept, or when I came up with what would be a way to up the series in a whole new way, should I go for that? This isn't the first time I've been faced with such a dilemma...my planned conclusion for Riyria was much different than the published one, and it took about 6 - 9 months of cajoling with my muse for her to give up that piece of information...something I thought was well worth waiting for. So as I was nearing the end of Book #4 in this series, I faced the same sort of crossroad...and I took the path less traveled. Rather than taking the easy way out, I've decided to once again expand the series and now it will be five books. It's decisions like this which is why I want to write the entire series before publishing any of the books. I can now make some minor adjustments to book #1 to account for incorporating that "really cool idea." Will this set things back again? Yeah, it will. But not too badly. I have a clear idea of where it is going and another 3 - 4 months in the grand scheme of things is not much of a wait. Weighing the pros and cons I think this is the right thing to do. So, good news and bad news...Book #4 is done, but I'm still not finished with the series as a whole. I'll keep you updated as the saga continues. I'm doubly honored. 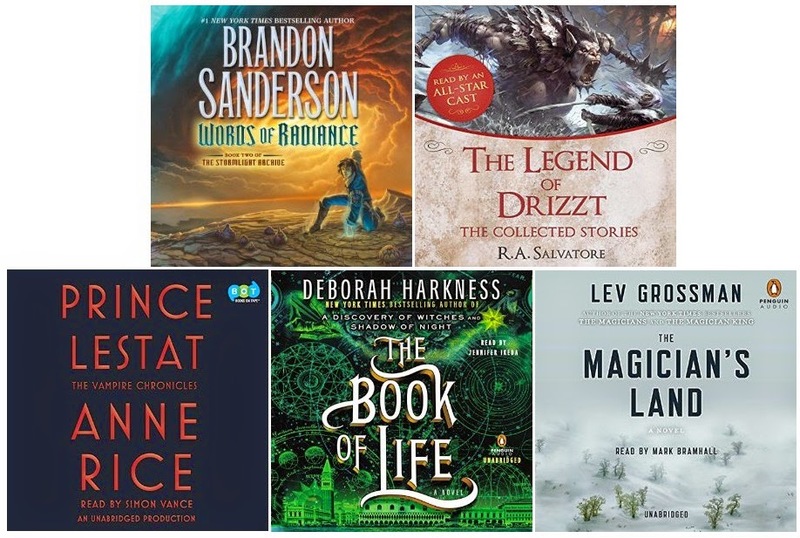 First, by being included with an incredible array of Science Fiction from some amazing authors, and second, because it is the readers who select who is nominated. In the past, my other three nominations came in the first round, determined by rankings and number of people who have shelved the book. 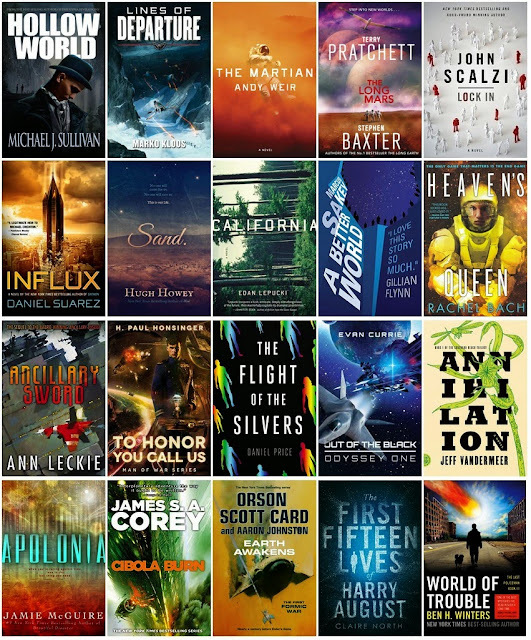 This year, I was thrilled to get an email from both my agent and publisher indicating that Hollow World was one of the five write-in nominees. I really hadn't expected that, and I'm so grateful for all the people who worked to get it on the ballot. Second round entries never win...they miss out on a ton of votes that occur during the first round, and even if I didn't have that handicap working against Hollow World, I have no illusions about it's widespread appeal. Still, it truly is an honor just to be nominated and I couldn't be happier about that. If you would like to add your vote to the more than 1,800,000 people who have voted this year. You can do so by clicking this button. At five o’clock the sun was still two hours from rising, but I was getting up. I’m well aware there are wonderful people who get up this early everyday. People with important jobs, people with awful jobs, people whose only time to exercise is before their important or awful jobs who drag themselves out of bed and out of the house before the fella who throws the newspapers from the window of his car drives by (and of course, he’s one of them, too). And some people actually like getting up early—people who might have been Benedictine Monks in another life, or if things had gone differently, in this one. I’ve hated getting up before the sun since I was old enough for school. Never seemed right starting a day before the day started. Puritan work ethic be damned, this has to be a sin. If God wanted people to get up earlier, the Almighty would have switched on the overhead sooner. One of my greatest pleasures—one of the most wonderful perks I discovered—upon becoming a full-time writer was that I never again had to get up before dawn. Yet on Friday morning, September 13th (yes, Friday the 13th) I did just that. I squinted in the stark glare of the bathroom light brushing teeth and searching for clothes I laid out the night before. 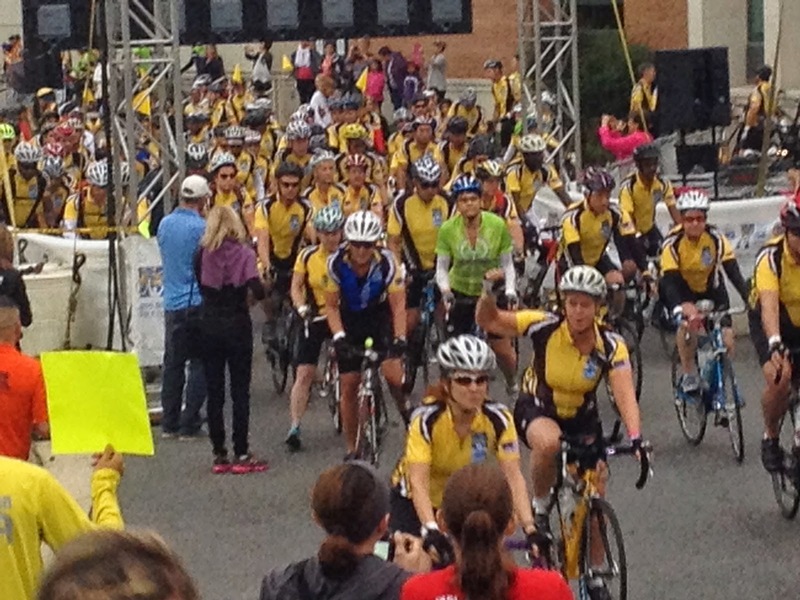 Spandex shorts with padding in the seat, low rise cotton socks, slipper-like sneakers, and a brightly colored yellow, black, and white biking jersey with an American flag patch on one shoulder and a blue Ride to Conquer Cancer logo on the chest. After a summer of training as best I could, the big day was here. I was going to ride 150 miles on my wife’s bicycle. Two days later I would celebrate my 53rd birthday. I’m not athletic. The only sport I played in high school was tennis, and I only did okay. I’m not overweight. I was underweight most of my life, so when I hit the mid-thirties-metabolism-slow-down, I ballooned up to a normal person’s weight. Still, for the last decade I’ve been a novelist, which is about as sedimentary as a professional World of Warcraft gamer. I did try and bike five to ten miles several times a week, and I often took walks to conceptualize stories, but there’s a world of difference between that and preparing to ride a century and a half over two days. Thing was, I figured the distance would be my biggest problem. I had no idea what lay ahead. 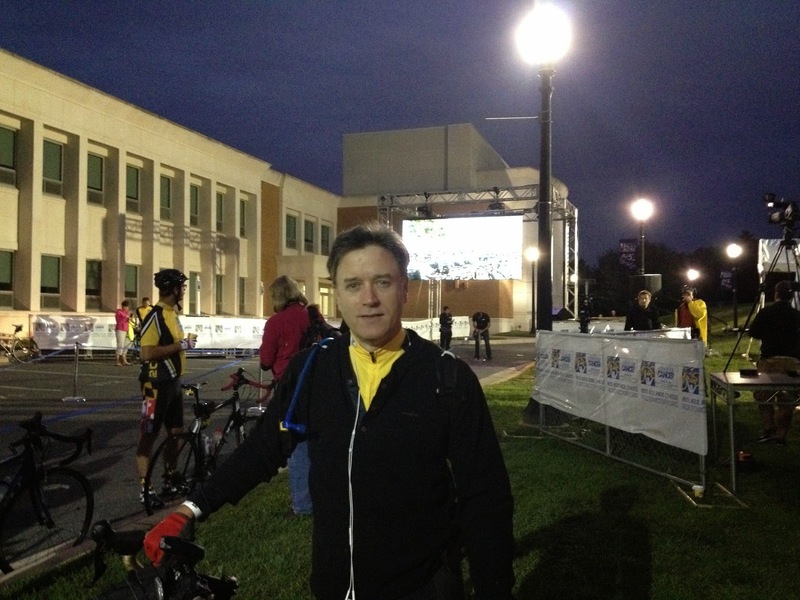 I’m one of those people whose stomach doesn’t wake up until around ten-thirty, so while my wife drove us in the dark to the start of the ride, some twenty minutes away in Maryland, I force-fed myself a bowl of tuna fish pasta and baked beans. This magic combination I determined to be the only thing I could make myself eat that would also sustain me for hours of biking. 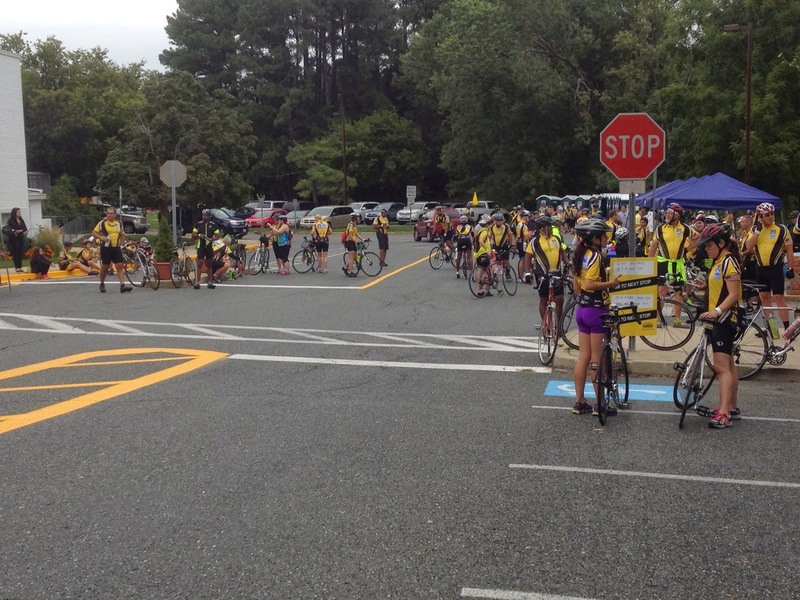 We arrived at the Academy of the Holy Cross where an army of yellow jerseys were bivouacked on a lawn under arc lamps. A row of green plastic “Gene’s Johns” lined one end, while the rest was filled with white tents housing food, information, bike mechanics, media sign-ups and rider check-In. Blinking, still barely awake, my wife, Robin, made sure I had my gear and snapped pictures like a proud mother on her boys’ first day of school. As the sky brightened to a gunmetal gray, the ceremony began at the starting line where we all waited holding our bikes. The national anthem was followed by a morale rousing speech, then a heart-felt, tear-welling address by cancer survivor Andrew Reed who was joining in the ride despite news his cancer had spread and had undergone surgery little more than two weeks earlier. Then as music blared we were unleashed in a congested line of matching jerseys and an odd assortment of helmets, gloves, capes, and bikes. I waited letting most of those with sculptured calfs and snap-on peddle shoes go ahead. I held up until almost everyone else was gone, then I slowly, tentatively mounted up, waved goodbye to my wife, and began peddling. Go slow. I told myself. This isn’t a race. I just have to finish. Turns out I didn’t need the advice. We were single file on a narrow road and riding tire-to-tire for miles. Bikes peeled off to adjust hastily assembled gear, and I moved ahead. Then I soon began to see folks on the side fixing flats. Already? This turned out to be a chronic problem as I passed dozens of riders on the side fitting new tubes to injured tires. Later I realized why. Maryland has a lot of junk on the sides of roads: screws, glass, nails, pins. Soon I felt like Hans Solo flying through an asteroid field. We hit a few hills where traffic was light and I found myself passing a number of the slower riders. This made me feel a little more confident. I wasn’t at the end anymore. Mile by mile I crept up the pack and was feeling good. The tuna salad and beans were doing their magic, and twenty miles later when it came time to make the first pit stop I had no need to bother and just kept on rolling. Instantly I was in another league. By skipping the stop I had moved way ahead and suddenly those I rode with were lean, muscled youths. Men and women I had no business riding with. I kept my head down and just tried to find my normal rhythm. We traveled north through meandering roads past homes that had McMansions for garages. These places had named roads for driveways and gates with separate entrances and exits. As I approached the thirty mile mark, I was getting hungry. My fuel tank light was on and I’d needed more magic beans to continue, but otherwise I was feeling good and began to think, this wouldn’t be so bad. The weatherman had promised a sunny day with a high of 75. The weatherman is not to be trusted. The weatherman I think was invented by the brother’s Grimm. That gunmetal sky never got any brighter and by mid-morning it was chilly and a light rain began to fall. I quickly shoveled down forks full of pasta and beans and a few bites of a Snicker’s bar. Then I changed clothes. Years ago when we used to kayak, my wife and I bought these expensive fleece shirts that, when worn next to the skin, can keep you warm and dry even after a dunking in the ocean. I slipped the fleece on and my jersey over top and shivering so hard the bike shimmied, I set out once more, this time into a solid downpour. Keeping my head down and using the visor on my helmet to protect my eyes from the drops, I plowed on, and after the first few good hills I warmed to a comfortable level. Only problem was, there were more than a few good hills. Maryland as it turns out is not the midwest. Apparently a mountain range runs through it. Spraying water on slick roads we dove up and down hugging white lines on narrow two lanes that cut through what I’m certain was a very picturesque landscape. The few glimpses I had of the idyllic farms and corn fields with green mountains rising in the rainy mist was lovely, but who had time to look? I was watching the white line where the narrow shoulder—in addition to the afore mentioned screws, glass and nails—was also mined with holes, grates, and washouts. As riders ahead pointed out traps to those behind, I no longer had trouble wondering why so many were repairing tires, but by why some weren’t. The cool temperatures lingered, the rain continued, and so did the ride. Mile after mile passed and soon I found myself alone on a vast empty country road wondering if I had missed a turn. They had arrows and decade mile markers stapled to telephone poles along the way, but I could easily have missed one. Just as I was growing concerned I saw another marker and knew I was on track, but I was still alone. From thousands to one, it was a strange feeling. I wasn’t really alone. My wife was in the car leap-frogging me and already at the next pit stop. She would occasionally call me asking how I was doing, her voice popping in my head via one earbud. She sounded like Lindsey talking to Bud when he descended to the bottom in the Abyss in the James Cameron movie, only it wasn’t near that bad, wasn’t too bad at all. As I left the final pit stop with only ten miles to go, I was feeling downright cocky. Then came the hills. One after another, each one bigger than the one before. Cresting one, gasping for air, we’d see another hill looming. By the sixth or seventh, even many of the young and fit began walking their bikes. I refused. I wanted to be able to say I rode the whole way, but that final hill was a killer. There ought to be a motivational saying that starts: “When you can’t find the strength to peddle up the hill and discover you’re already on your lowest gear, that’s when you find what you’re capable of.” After riding seventy-one miles they saved the toughest for last. Mount Two-lane Asphalt went nearly vertical—at least it seemed that way. Gripping the bars low with my head down so that the rain water dripped off my nose, I locked my upper body and just pumped—breathed and pumped. I must have been going all of about .0002 miles an hour up that hill. Worms driven up by the rain were passing me. At times I wondered how I was staying vertical, and then I noticed the effort lessen and I was at the top, then down the other side and coasting into the end of Day One while people cheered and rang cow bells and thanked me. People thanked me a lot. Folks handing out apples and peanut butter (a fantastic taste treat I never tried before) thanked me for riding. People handing out bananas and peanut butter (another must-try combination) thanked me. 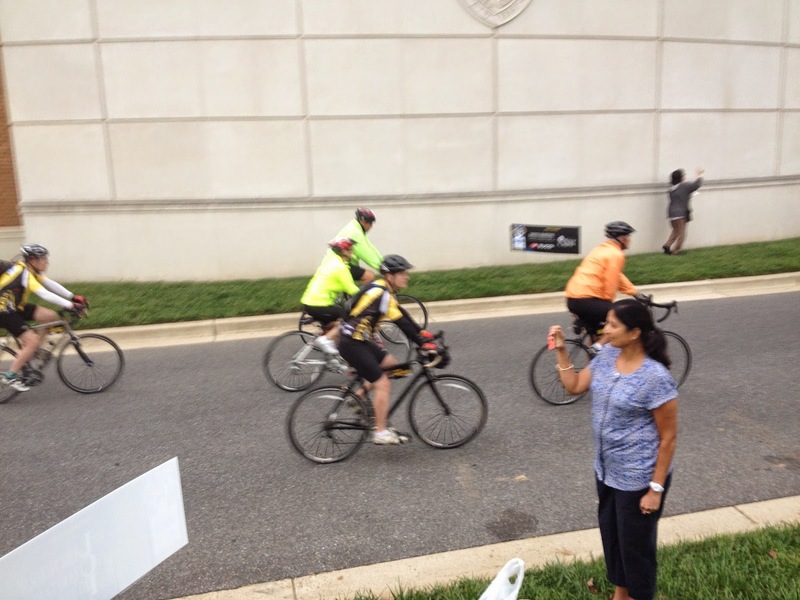 Crowds along the road, police officers directing traffic for us, and even other riders thanked me. Thing was I honestly didn’t know why, and it made me uncomfortable as if I was pretending to something I didn’t deserve. I was just riding a bike. Granted it was in the rain and cold, but I’ve done stupider things in my life for no reason at all. I went canoeing for six days in similar weather sleeping in a soaking tent. No one ever thanked me. Sure, this was to raise money to fund finding a cure for cancer, and sure I gave some money too, but mostly I just asked other people to give money to the effort. Those are the people who did something, and it was usually people who didn’t have much money to give, but they did anyway. I ended up raising about $3,000 for the ride, and the ride as a whole raised 2.6 million, but mostly all I did was ride a sodden bike for two days. And I didn’t even have to do that. If I wanted to I could have given up, packed the bike and gone home. It wasn’t like if I didn’t finish the money wouldn’t be used. The funds I raised would still be collected, still go for the cure. 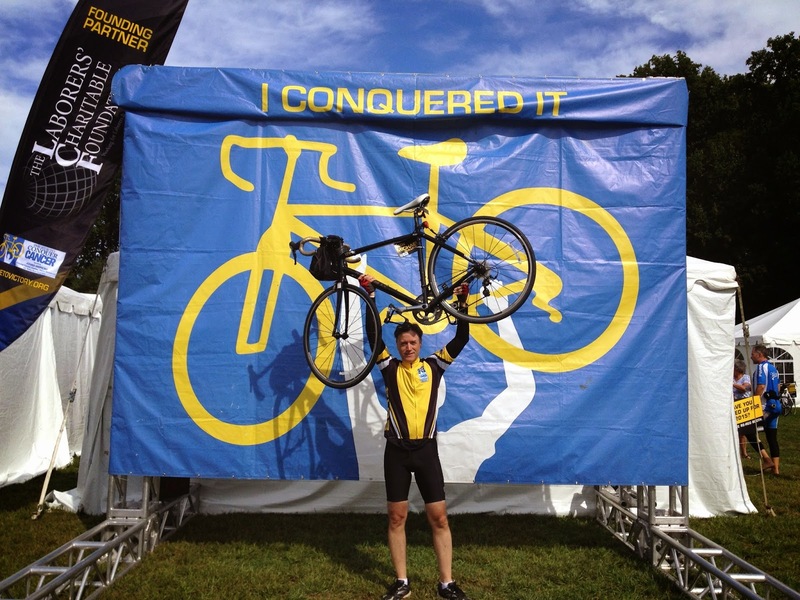 The ride was pointless—but still, I had promised people that I would do it if they gave. I never once believed that’s why they gave the money, but I hate failing to fulfill promises. Maybe that was why I refused to walk the damn bike up the mother-of-all-hills even when no one else was there to see, even when it didn’t matter. And still it felt awkward having all these people thanking me as if I’d personally cured cancer that afternoon while peddling in the rain. I wish it was that easy. The next day the weather had one more surprise. No more rain, but the temperatures dropped to 48 degrees. Usually I never bike in temps below seventy. Forty-eight was uncalled for especially when everything everyone had was soaked through from the day before. Getting up in the cold—again before dawn’s early light—and in having to put on wet shorts and waterlogged sneakers, and then bike in a headwind is…well, the opposite of fun. Thankfully I still had my fleece, my wonderful mithril armor, that I wore beneath my jersey. That morning we rode out under a cloud-free sky to a rising sun that scattered shadows across farms and fields. My legs, as you might imagine were not pleased with me. I learned that at age forty, my body no longer recovered from excessive anything after just one night’s rest. At fifty, that point was beyond obvious. I began riding on rubber band thighs. The good news was that after the first downhill glide, I couldn’t feel them much because they were sort of numb. It could have been worse. It could have been a hundred degrees, or I could have been one of the many riders with yellow flags attached to the backs of their bikes. The flags designated cancer survivors. We all rode in the rain and cold, and rode a hundred and fifty miles through punishing hills and dangerously narrow roads, and I never heard a single complaint. 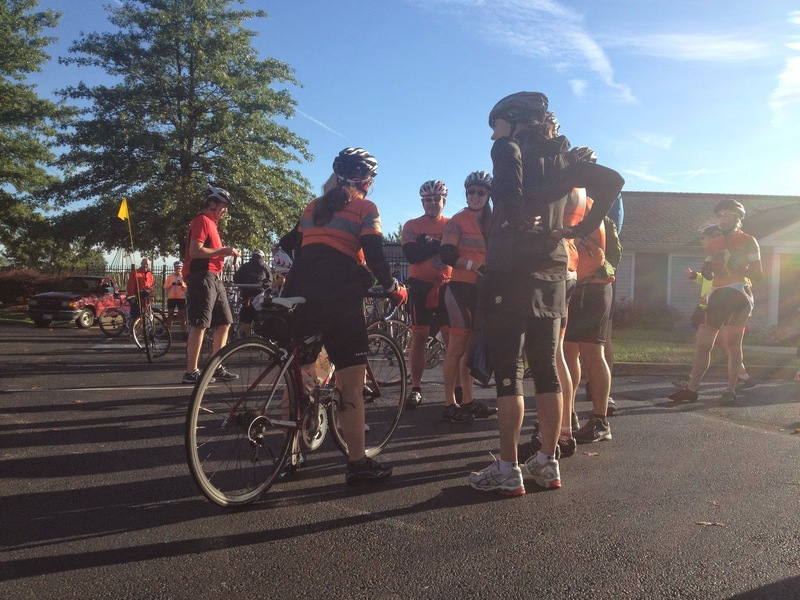 All I ever heard from my fellow riders were words of encouragement to each other. If that sounds like dialog from a great war movie where a raw platoon struggles though a rough hike, that’s sort of what it was like. Everyone watched out for everyone else, and for one brief shining moment, total strangers were life-long friends. And then we were rolling in the fenced off corridor of fame where tv cameras threw our images on a big screen and an announcer called off names and congratulated us, and again thanked us. A whole crowd of strangers filled a hillside applauding and everywhere I went I was thanked. They had food. They had drinks, but I didn’t stay. I took my obligatory photo in front of the I Conquered It sign, and left. I didn’t want to be thanked anymore. As I walked my bike out to the parking lot a man asked if we were going to do the ride again next year. And there it was that unrelenting optimism that couldn’t be squelched, that couldn’t be marred even by decades of disappointments and deaths. I thought of all the people who consider fantasy books about heroes that do good for good sake, or who keep fighting against an impossible foe and say such things are simply unrealistic., that people don’t act that way in real life. People are innately selfish, cowards who’d throw their neighbor under a bus to get a step further ahead. I thought of those people, and then of all the riders I’d spent the last two days with, and all those people standing in the rain on street corners cheering us on, all those who gave their few extra dollars when I asked, of my wife who watched out and took care of me along the whole route, and of Andrew Reed, and the other yellow flagged bikers, and I stopped. I halted right there in the parking lot and turned to the guy asking about next year’s ride. There's news on the Unveiled front (formerly titled as Neverland's Shadow). You can now pre-order copies over at Grim Oak Press. For those that don't know, this is an interesting concept where the stories are told from the point of view of the villains. And yes I have a story in it. Who else is contributing? THE SIGNED & NUMBERED EDITION —This edition of Unveiled is limited to 500 copies, signed and numbered, leather-bound, ribboned and slipcased. It will match your number of Unfettered and will give you the first chance to buy the Signed & Numbered edition of Unfettered II! NOTE: For the month of October, those who ordered the S&N edition of Unfettered have first chance to buy the S&N edition of Unveiled. If any copies remain after October, they will go on sale for everyone in November! THE ADVANCE READER COPY EDITION — The ARC of Unfettered was a huge success last year. It allowed those who couldn’t order the Signed & Numbered edition of the anthology to feature a book as rare on their shelves. The ARC of Unveiled will have the white cover as its predecessor does and it will be limited to 250 copies! THE TRADE HARDCOVER EDITION — The trade hardcover of Unveiled will be produced with the same quality standards as Unfettered and will have a cover painted by artist Todd Lockwood! It will also have interior artwork! The print run for this edition will be dependent on the amount of pre-orders received. THE EBOOK EDITION — There will be an ebook of Unveiled. It will feature all of the stories in the trade hardcover edition and will publish on the day the hardcover arrives. If I can discover next week how to feature it as a pre-order on the various ebook websites, I will do that. So rush on over to Grim Oak Press to learn more.